I’m picked up at 9.30am by Will and Dempsey and head to Joels house to pick him up. On the way we drive past Eiger studios and notice our friends The Accused unloading. That’s dedication for you. Band rehearsals at 9.30am on a Sunday. We arrive at Loom Studios at 10am. The room is as we left it the previous day. I notice the album track listing on the table and I analyse the previous days progress. We make some tea and coffee. Will has brought his own cafetière. I jokingly accuse him of being a privileged punk whilst I stir my Twinings Indian Spiced chai tea. We gather back in the control room and immediately start listening to the previous days work. Overall we are very pleased. We put a question mark at the side of ‘Mental’ because we think we can do it better so we’ll come back to it later. We still have four songs to do today. ‘Lake of Fire’ is the most difficult of them so we start with that one first. We manage to capture it easier than anticipated. 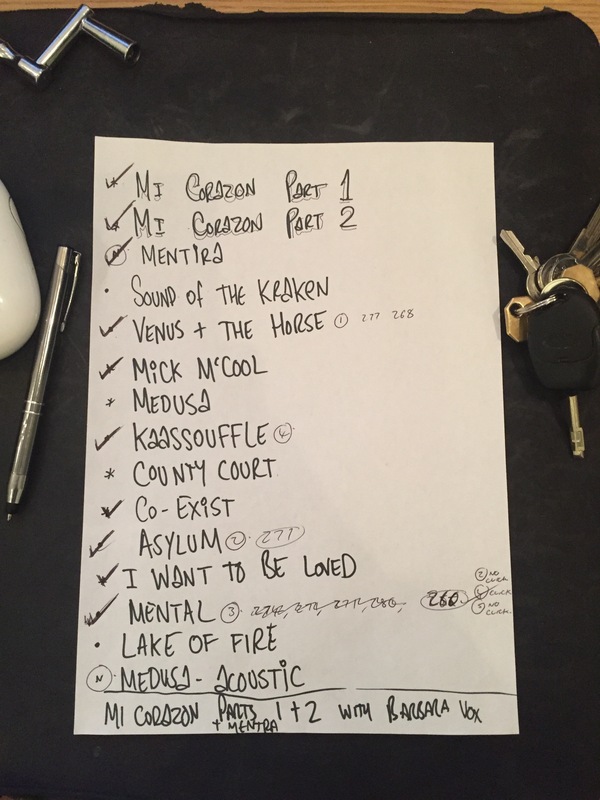 ‘County Court’ and ‘Medusa’ are also recorded without hiccup. ‘The Sound of the Kraken’ was alright after a few false starts. Dempsey’s bass kept falling out of tune and become quite off putting. Before one of the takes I frustratingly ask him if he is ready for a take he says “Yes” I reply with “It’s just that you’ve got a screwdriver in your hand” Grant pisses himself and lightens the mood. We then manage to record a brilliant take. We decide to break for lunch. I set up a Facebook live stream with Grant to do a q+a type thing but it didn’t quite go as planned with complaints of poor connections. We decide to end it and I go out to grab a sandwich. After lunch we decide to revisit ‘Mental’. My thoughts are that it is too fast and too similar to two other songs on the album and it is a long way away from the song that I wrote. We load up my original demo and decide to try a version more akin to that. The new version would be much slower than the version we recorded the previous day. Giving it a more post-punk feel. We all agree that this version works better and adds a different dynamic to the album. I mess around with my vocal and I try mimic Ian Curtis and Glenn Danzig. After working on ‘Mental’ Grant feels as though he has all the drum takes he needs and starts to analyse and edit each song from the weekend. Me and Will start working on an idea for the album cover. We also start thinking about an album title. We leave the studio at 6pm and we head home. I continue working on the album sleeve whilst listening to the studio recordings on my home system. Later in the evening I send Will a design and he’s really pleased with it. We both like the sound of the album title too.